One of the things we did A LOT while been in vacations was eat =] I love Chilean food and since we have only found 2 Chilean restaurants in LA I was craving all of it. 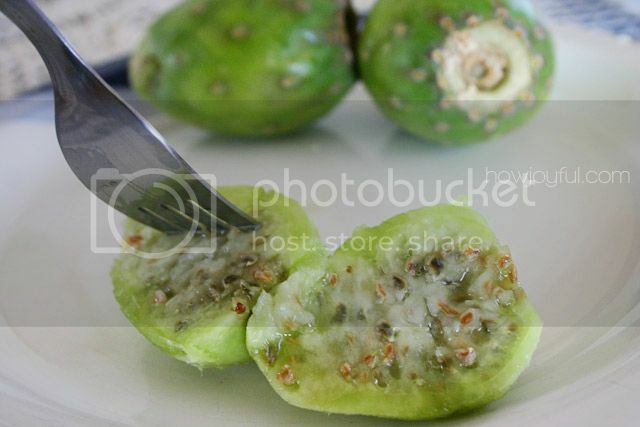 And one of the things I craved the most was my favorite fruit “Tunas”. I found out that cactus fruit was the translation or Prickly Pears. Anyways this little bites of heaven can be found anywhere but not in the massive amount at the super cheap price as in Chile and most south American counties. This cuties are not for everyone tho, they have a very strong texture because of all the seeds, they are sweet and a little sour but if you are in to food with texture this is a must! It's like sweet and sour explosion, I just love it! And since most of them could still have little cactus spike, you have to be careful in how to touch them and peel them – I hated having almost invisible cactus spike in my fingers when I was little, but that was because I couldn't wait for my mom to peel it for me LOL – To do so you cut the top and the bottom, them make a horizontal cut through the body and with knife and fork open the fruit, the awesome part is that the fruit comes out super easily. I've seen people adding them to salads or mixing them with sour cream, I am not a fan of mixing them with anything, they just taste so good as is. Ken and I eat probably 30 of them just on an hour! It was his first time eating them and now he's just as a big fan as I am. He did say it was not the texture and flavor he was expecting but loved it! This are summer fruit so I can't wait for it to be summer here so I can go hunt for more =] Even tho I don't think I could ever beat the prices in South America. 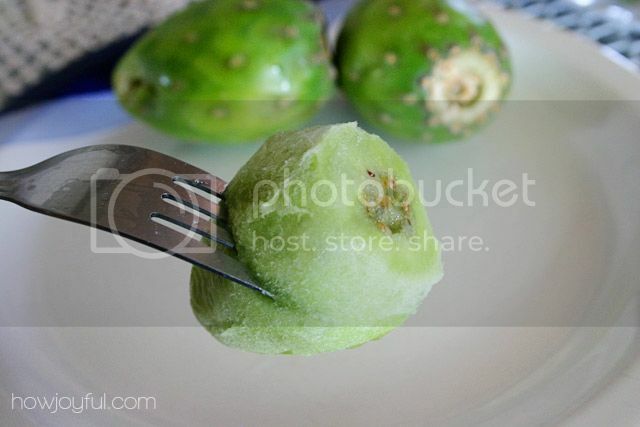 So how about you, have you eat Prickly Pears? Do you like them? 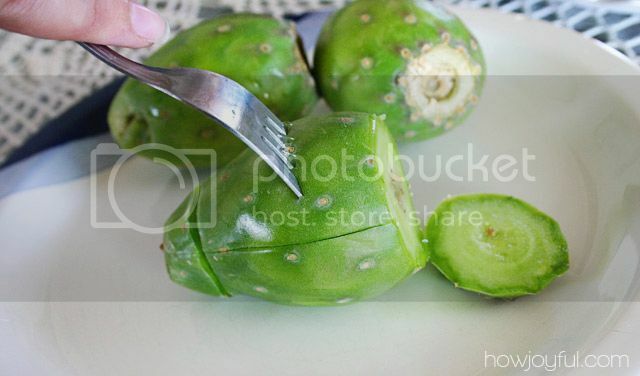 I’ve never heard of prickly pears before, but they look really interesting and yummy! I’ll have to look for some the next time I’m at the grocery store. 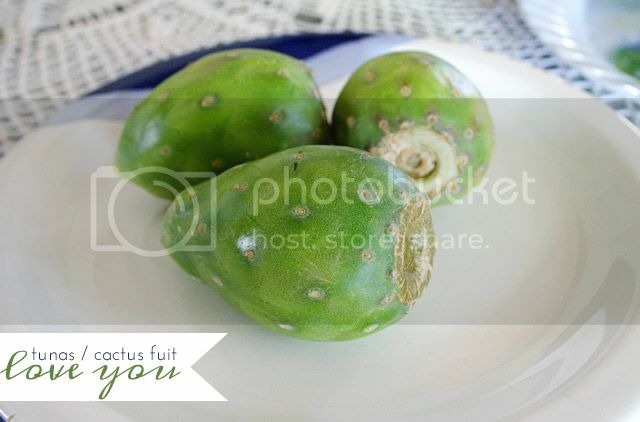 I’ve heard of prickly pears, and even seen a ton of them growing on my parent’s property, but I’ve never tried it! 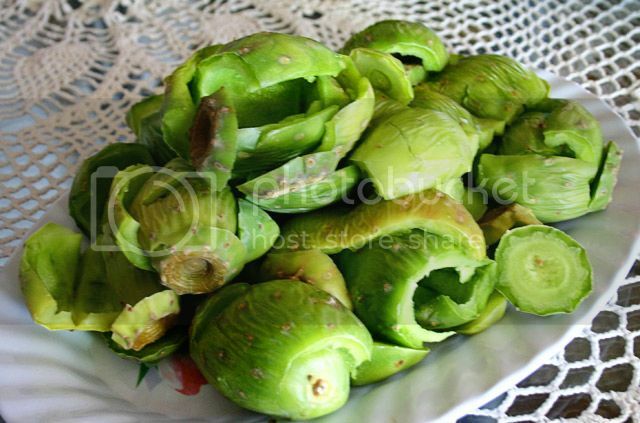 I’ve never seen (or heard of) green tunas! YES!! Im in Florida and we have them here at the farmers markets and we like then. BUT, we have purple ones, Id like to try the green ones…Im wondering if they are the same thing? Doesnt matter, Ill eat them anyways HA! Thanks for showing a good way to get to the goodness….Im going to be on the look out for the green’ens!! Tunas were the only thing that went wrong on my Mexican vacation. I loved everything about it. Never go sick from street vendor food. Adored spicy salsas. Never craved hamburgers like my roommates. But my enthusiasm to harvest tunas left my palms covered with thorns. I actually got a ride home early from the country.